Drupal is arguably the best Content Management System (CMS) available for free, it may not be as popular as Joomla mainly because of a steep learning curve but it is a solid system with lots of features out of the box. 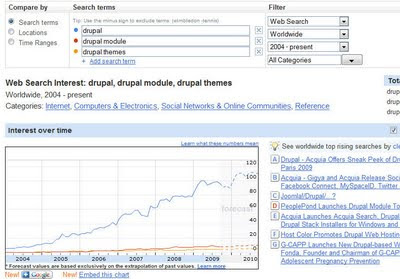 More features can be added on in the forms of modules and look and feel can be changed in the form of themes in Drupal. With Drupal 7 code freeze already happened and we waiting for the best Drupal release ever Drupal has gained popularity than ever. Below are some of the statistics I got from Google Insights: The chart shows Drupal’s search popularity in Google in past 90 days. 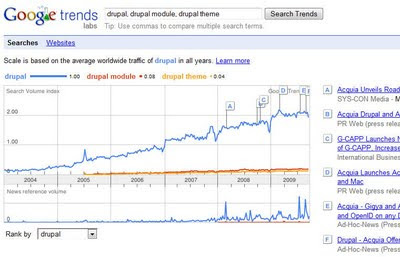 Statistics below indicate that Open Atrium is very popular, and drush the command line interface for Drupal is also in the popularity race.